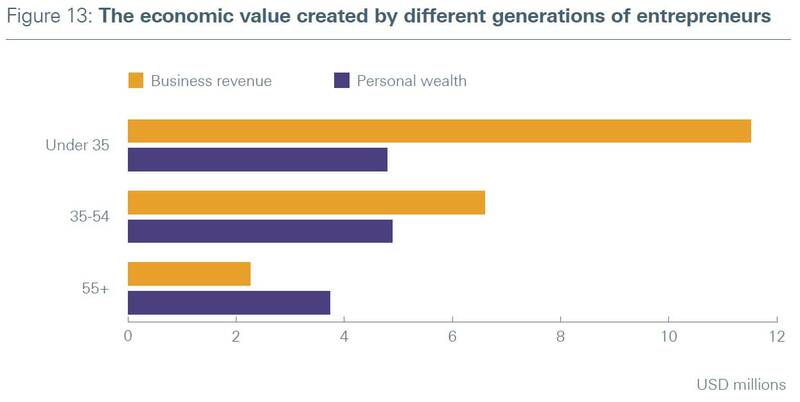 Millennial entrepreneurs earn more money than their older peers, and are also more motivated by an effort to find their purpose and give back to society, according to a new report. 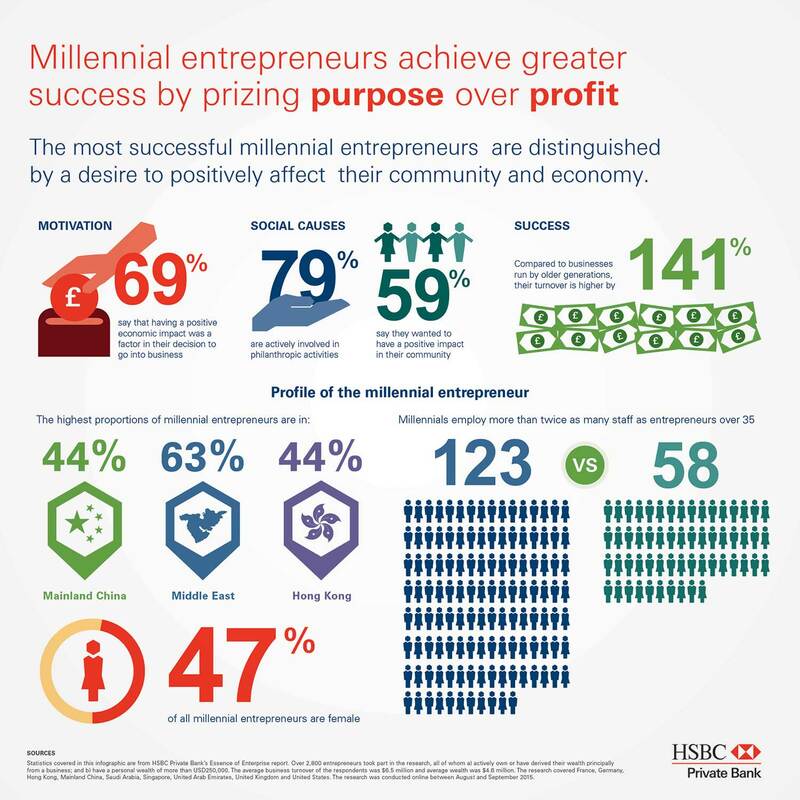 Millennial entrepreneurs were considered those under the age of 35 for the HSBC research, called the Essence of Enterprise report. Those millennial entrepreneurs surveyed by HSBC had businesses with annual revenues of $11.5 million, nearly one and a half times the $4.8 million average annual revenue of all the entrepreneurs surveyed for the report. Millennial entrepreneurs have more employees, too. The main business holding of an entrepreneur under the age of 35 included in this survey has 123 employees, compared with 58 employees in the main business holding of entrepreneurs over the age of 35. For the research, HSBC surveyed 2,834 entrepreneurs throughout the world. Entrepreneurs were tracked both by age and location. All of the entrepreneurs had a net worth between $250,000 and $20 million. To be included in the report, individuals had to be a major shareholder, manager, executive or strategic investor in a privately held business. Millennial entrepreneurs are running larger businesses with more employees than their larger counterparts, but making money isn’t their only concern. “They are as motivated to create an impact on the world as they are to make money and they are having a positive impact on their communities,” Levitt says. Almost six in 10 millennial entrepreneurs report that they want to have a positive impact on their communities. Meanwhile, nearly four in five, 79 percent, of millennial entrepreneurs are active philanthropists. And the more successful these millennial entrepreneurs are, the more they are giving back. Among those millennial entrepreneurs whose businesses are making more than $11.5 million in revenue, 89 percent report being actively involved in philanthropy in the past year. For a deeper look at the characteristics and motivations of the global, millennial entrepreneur, have a look at the infographic summarizing findings from the report, embedded below.